A 7 month old intact male domestic shorthair presented after being found in a dryer that was running. The owner reported the dryer was on the low setting which intermittently turned on and off for approximately 30 minutes. The owner reported he had been acting normally since discovered, no neurological deficits or evidence of lameness were noted. He had not eaten or drank since the incident but the owner had brought him in soon after discovery. On presentation, the kitten was stable with a heart rate of 180 with normal sinus rhythm, a respiratory rate of 42 and temperature of 99.9oF. His mucous membranes were pink and moist and his capillary refill time was less than 2 seconds. His skin was visibly erythemic and there was dried faecal material adhered to his coat but no outward burns or trauma were found. His mentation was appropriate and neurological exam was within normal limits. The owner consented to bloodwork but declined other diagnostics and treatment. The kitten went home for further monitoring by the owner pending the bloodwork results. Bloodwork results revealed elevations in albumin (4.1 g/dL), ALT (5002 IU/L), glucose (318 mg/dL) and HCT (50%). The elevated blood glucose in this case was attributed to a stress hyperglycaemia. Haemoconcentration is a common finding in cats that have overheated and may be related to dehydration. The severe elevation of ALT was attributed to both heat and physical trauma from the tumbling action of the dryer as all other liver values were normal. The platelet count was decreased (108 x103/uL) but the blood smear review indicated the platelet count reflected the minimum due to clumping. All other values were within normal limits. The owner reported the kitten was doing well at home the next day after sleeping a large portion of the rest of the previous day and 1 week later reported the kitten was normal. Ideally, further diagnostics for a suspected heatstroke animal may have included radiographs to rule out traumatic injury and look for evidence of pulmonary oedema, coagulation testing to look for prolongation of clotting times and evidence of DIC, blood pressure assessment, and ECG to assess for cardiac arrhythmias. 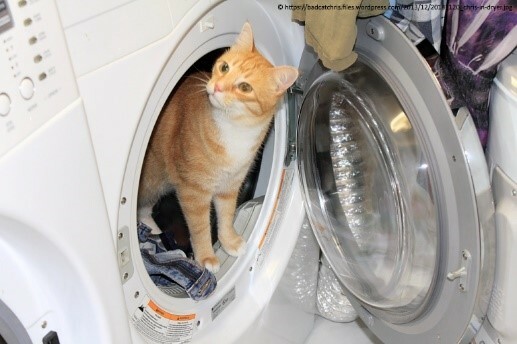 While heatstroke is uncommon in cats, it is usually associated with incidents of accidentally being locked in clothes dryers due to their tendency to seek out warm or dark locations to hide for naps. It is more commonly associated with dogs that spend a lot of time outdoors in the summer or are left in hot cars or cages. Heatstroke in cats and dogs is characterised by an elevation in body temperature to greater than 105.8 oF from exposure to a hot or humid environment (non-exertional) or from strenuous exercise (exertional) where the body is not able to dissipate heat effectively. It can also be related to severe, uncontrolled seizures or tremors and the incidence is higher in obese animals. Heatstroke differs from fever as the body’s thermoregulatory set point is not raised while the body temperature is elevated. Common findings in heatstroke include panting/tachypnoea, tachycardia, dehydration, collapse, shock and evidence of spontaneous bleeding (e.g. petechiae, haematemesis, haematochezia, etc.). Mucous membranes may be hyperaemic, muddy or pale depending on the state of shock and CRT may be prolonged. Body temperature may be elevated or normal on presentation depending on if cooling has been initiated. Hypothermia on presentation is considered a poor prognostic indicator. The marked elevation of body temperature during heatstroke leads to peripheral vasodilation causing increased cardiac output and eventually cutaneous and splanchnic blood pooling as well as dehydration which contribute to hypotension and hypovolaemia. In response to this, cardiac output increases further and leads to an inability to dissipate heat through radiation and convection mechanisms and allowing body temperature to continue to increase. Endotoxaemia may occur from increased gastrointestinal permeability and endothelial injury and contributes to increased vascular permeability and interstitial oedema. Complete blood count abnormalities include haemoconcentration, thrombocytopaenia and leukocytosis or leukopaenia. Anaemia may be found in some cases. Blood smears typically show large numbers of nucleated red blood cells (more if renal failure or DIC is present) and is thought to occur due to the effect of high temperatures on bone marrow. Serum biochemistry often reveals azotaemia from pre-renal and renal causes (e.g. dehydration, hypovolaemia and direct kidney injury), elevated CK from rhabdomyolysis, elevation of liver values (ALP, ALT, AST and GGT) with hepatocellular hypoxia and cholestasis, elevation of bilirubin and hypoglycaemia from bacterial sepsis, hepatocellular injury and seizure activity. Hypoglycaemia on presentation is considered a poor prognostic indicator. Hyperkalaemia is the most common electrolyte abnormality and is likely due to rhabdomyolysis and cellular death. Sodium may be elevated or decreased and decreases in phosphorus and calcium may be seen. Hypoxia leads to metabolic acidosis and compensatory respiratory alkalosis which may be seen on blood gas evaluation. Coagulation panels may show prolonged clotting times (PT, APTT), decreased fibrinogen levels and the presence of D-dimers and fibrin degredation products (FDPs) which can indicate DIC and are associated with poorer prognosis. Higher temperatures (109 oF) lead to platelet aggregation, activation of the coagulation cascade, fibrinolysis and the generation of pro-inflammatory cytokines and reactive oxygen species. Immediate treatment of severe cases should include cooling therapy and should be instigated by owners on their way to the hospital. Towels soaked with cool water may be placed over the patient and air conditioning or movement of cool air instigated to aid evapourative and conductive heat transfer (the primary forms of heat dissipation in dogs and cats). Ice water and ice packs are not recommended due to excessive cold leading to local vasoconstriction which actually decreases heat loss. Once at the hospital supplemental oxygen should be provided and IV fluid therapy instigated. Other therapy may include dextrose, antibiotics, GI protectants or Mannitol and is based on results of testing. Monitoring is based on severity of the patient on presentation. Prognosis for heatstroke patients is highly variable and related to severity of clinical signs on presentation as well as response to therapy. Poorer prognosis is associated with hypoglycaemia, prolonged coagulation times, and the development of DIC, acute renal failure, hypothermia, seizures or coma.